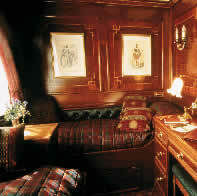 Welcome aboard The Royal Scotsman, your impeccable host for a journey into the beautiful Highlands of Scotland. This is travel the way it was meant to be: luxurious, leisurely and full of discovery. Offering two, three and four overnight tours from April to October and accommodating a maximum of only 36 guests in wonderful State Cabins, beautifully decorated in rich mahogany each one with it’s own private bathroom. We’ll take you into the heart of Scottish history on an exclusive round trip where you’ll enjoy exquisite hospitality in castles,. distilleries and great country houses. Our attentive staff will look after your every need, our success is the service our guests receive. So attentive is it that all you have to do is simply arrive, unpack and relax, everything else is taken care of, meals, drinks and entertainment. 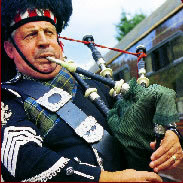 The Royal Scotsman has one of the very best restaurants in Britain, moving or stationary. Also included are fascinating visits to romantic castles and famous distilleries, where personal guides offer an insight into the country's unique heritage.